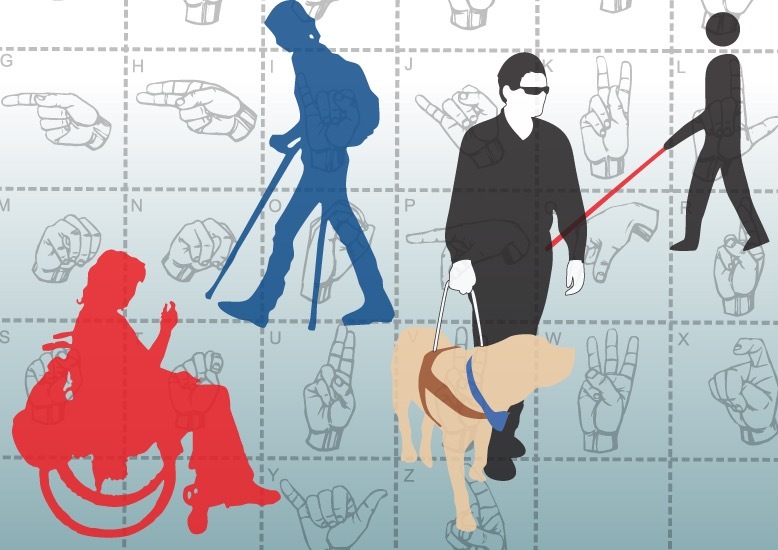 Navigating disability rights is often not as easy as people expect it to be. Recently, a blogger wrote about potentially ableist classroom policies, more specifically laptop policies. While there are good points, like how many people with disabilities do not want to be the only ones using a laptop (presumably for privacy reasons), the argument is missing a key factor that often eludes the discussion on disabilities and policies: not all disabilities are the same. Some disabilities are visible, while others are not. Some disabilities are physical, while others are mental or behavioral. Some disabilities affect hearing, while others affect sight. Obviously not all of these disabilities require the same accommodations. Someone with ADHD may need extra time for test-taking, while someone in a wheelchair may not. Necessary accommodations depend on the nature and overall effect of the disability. This is where policies can be difficult to enact. While someone may require a laptop in the classroom for note taking, they could distract a student with ADHD. This is not the student’s fault, but it still raises an important question that often goes unasked: if accommodations negatively affect others, what do we do? In this instance it is simple: the student with the laptop can be seated away from the student with ADHD, however, the demand for laptop policies to cease is not reasonable. If every student had a laptop, the student with ADHD would not be able to learn, which would violate his rights. In other cases, however, the answer is more nuanced. Last semester, a number of students were training service dogs on my campus. As a disabled student, I was overjoyed to see my able-bodied peers involved in the disabled community, however, the dogs on campus caused problems. What most of my able-bodied peers were unaware of was that having so many dogs on campus posed a threat to students with life-threatening allergies. While one or two dogs can easily be avoided, as the numbers grew it was harder for these students. My school decided that students raising service dogs could not bring the dogs into classrooms or dining halls; essentially the dogs were only allowed outside and in the dorms. This decision was well thought out, and ultimately was in the students’ best interest, but my misinformed able-bodied peers did not agree. They expressed legal concerns, stating that the ADA makes it illegal to deny service dogs access to public places. This is partially true; service dogs must be allowed in public places, but the ADA has no specifications for service dogs in training. These dogs are currently not providing life-saving tasks or tasks that promote independence for disabled people. The reasoning my school had (allergies), however, was not covered under the ADA. According to the ADA, “Allergies or fear of dogs are not valid reasons for denying access,” which makes sense, but can be problematic. The ADA clarifies its prior statement, saying that if someone has an allergy, they should be seated away from the dog when possible. This raises a question: if someone’s independence, endangers another person’s life, what should be done? The ADA fails to answer that question. Many disability advocates, activists, and writers fail to answer that question. To be fair, until this point I have not so much as considered this question. Writing about disabilities has proven itself to be controversial, stressful, and unpredictable. I never know how my audience will perceive my posts; sometimes people love them, and other times my perspective is downright “wrong” in their opinion. Most of my pieces are only considered controversial by able-bodied people who have always tried to tell me how I should feel about my body. I expect this. I know that some able-bodies may never understand. What I find more controversial is pointing out flaws within the disabled community (instead of just problems we face in the larger able-bodied community). This is my community–the people I fight for and the people that fight for me. I hate criticizing them because I have a deep connection to them. I also do not want to give the impression that I take their rights lightly. However, this is a grey area. If someone’s life is in danger or even if someone’s rights are being violated by another person’s accommodations, there is no easy answer. This means we must be careful about what we demand. We do not want to harm another person in order to help ourselves. On the contrary, our needs must be met to ensure our survival and success. I do not know how this issue can be solved, but I do know that it must be discussed. We can no longer pretend that accommodations are one-size-fits-all. We can no longer have one-answer questions where we attack anyone who has a different opinion. We can no longer pretend our community has all the answers. This is an insanely difficult area. I remember the challenges my late wife encountered when tactile dome paving first appeared some 25 years ago. On the one hand, she could see the benefits to the visually impaired. On the other, it increased the probability of a fall for her being mobility impaired. There are no easy answers in a lot of these issues, as its always a trade off. The biggest danger I think is that well intended advocates turn equality into an idol to be worshiped. Sadly,in the process of doing so, they end up hanging large swaths of folks out to dry with one sized all solutions that bring about massive unintended consequences. At some point, I think equality has to be tossed to the wind, and the focus needs to be making accommodations rather than universal, specific to the situation at hand. Granted, this is not ideal as situations change leaving some hung out to dry until a course can be corrected, to say nothing of the costs involved.